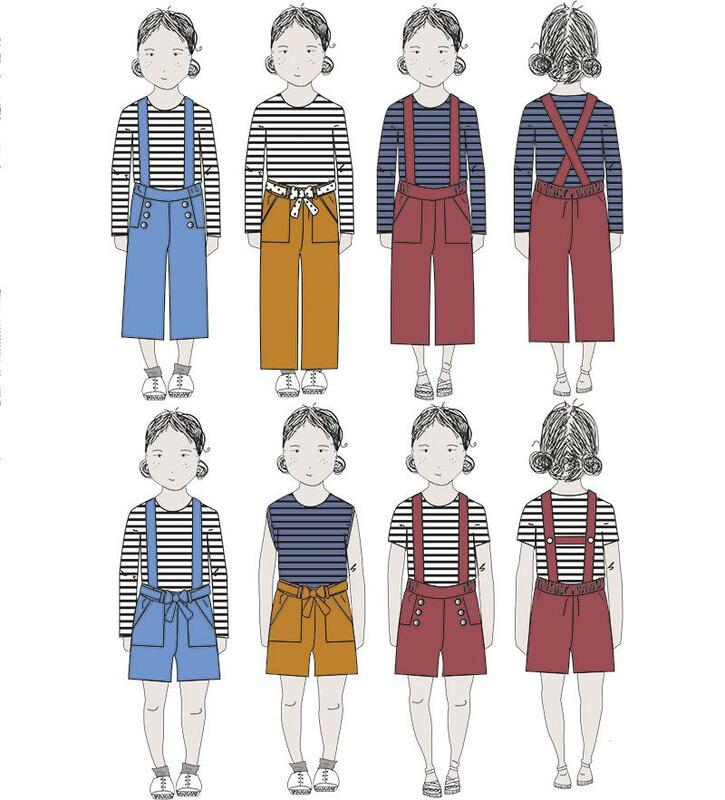 I first discovered the French children's sewing pattern company Ikatee when they contacted me last year with the offer to try one of their sewing patterns for free. 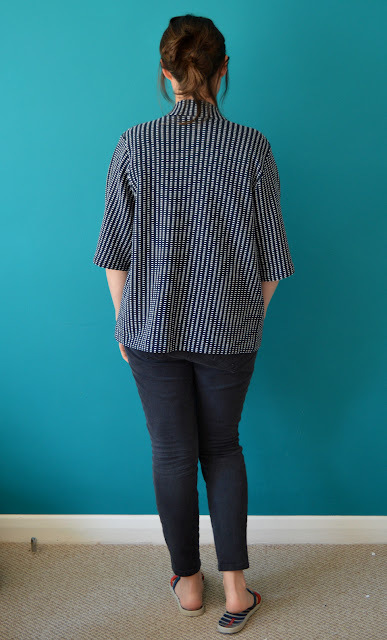 I tested the Corfou dress pattern (which I reviewed here), and have been excited to follow their business developments and new pattern releases ever since. When Ikatee released the Avana pattern earlier this year I was, of course, smitten. Dolores completed surprised me by saying she liked it too. I'm keeping my fingers crossed that this is a sign that she's relaxing her desire to wear exclusively the girliest of clothing styles. So I grasped the opportunity and threw the Avana pattern in my virtual cart before she could have a change of heart. What really sold this pattern to me was all the style options included. The first choice you need to make is between the 'sailor' or 'urban' looks. From there you can pick between shorts, 3/4, 7/8 or full length legs. Then there's two types of optional braces to consider, and, if you're making the urban look, whether or not you want to include the belt loops and waist tie. Phew. You may need a rest after all that decision making. So Dolores and I agreed on making the sailor option with the corresponding 'H' shaped braces. I was making this at the tail end of summer, so we went for the 3/4 length. She's about to turn five, so I cut the 5 years size, but chose the 6 years length because she seems to be taller than a lot of kids of the same age, plus I was hoping these would last a full calendar year. 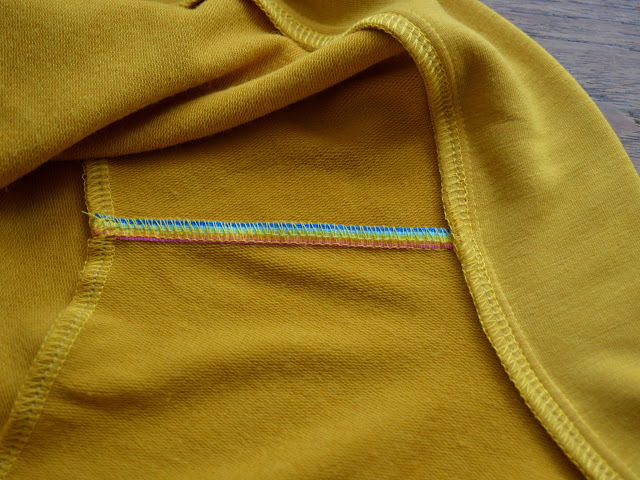 Another option included in the instructions is the choice between regular elastic or adjustable 'button hole' elastic. I went for the regular elastic option as that's what I had in my stash. The instructions themselves are very thorough, with digitised illustrations for each construction step. Generally, I found following along no problem, however I did develop two tiny gripes: the first is that, through including the steps for constructing all those different options, it lead to a bit of confusion when trying to work out which bits applied to you and which you could skip over. Secondly, the translation into English was a bit clunky at points, and the instructions could have benefitted from being run past a native English speaker before they were published. Like so much of my fabric stash, I have no clue where this 1.5 metre length of aqua poly/cotton twill came from. I've had it in my stash for so long that I remember having it on my fabric shelf when I lived in Barcelona circa 2009, although I know I had it when I lived in the UK prior to that. I've always loved the colour of this fabric, but could never figure out what it should become. Mainly I was confused by its weight: a bit too hefty for a blouse or top, but a bit too lightweight for making a skirt or shorts that I'd feel comfortable wearing. However, for kidswear, the weight seems to be just right. I don't know if it's still the case, but for a while, about five years ago, it seemed to be really easy to buy sets of vintage/retro buttons on cards like these. I found them on a number of market stalls and in haberdashery shops in a number of towns, as well as in Snoopers Paradise in Brighton, which is where these probably came from. I'm not sure if they are legit French vintage dead-stock, or just a cute repro. Either way, these lovely buttons have been in my stash for at least five years, and FINALLY found their purpose by matching this fabric almost exactly. The first point I need to make is that I'm AMAZED Dolores has agreed to wear these aside from for the indoor photos. I genuinely thought that I was making these exclusively for my own joy of making them. However, so far she's worn them twice, both times with this awesome striped M&S t-shirt that I picked up brand-new from a charity shop. Generally, I'm a big fan of this pattern. All the style options, plus a wide size range (from 3 to 12 years), make this pattern excellent value for money. There are plenty of thoughtful details, like including two options for top stitching around the front buttons on the sailor version. Plus, I really like how the braces are detachable, and the instructions require you to make two sets of button holes so that they're adjustable. What isn't so great is that they have come up quite small. And even on the longest setting, the braces are a bit short, and they don't sit very nicely at the back (see above). The second time she wore them out of the house, we agreed to leave the braces off, so I think that is how they are going to be worn from now on. I was hoping they'll still be of use for spring/summer 2019, but I predict that I'm going to have to pass these on to a smaller child and make Dolores the next size up. At the start of 2018, I already had a solid selection of handmade cardigans, all made using either the Jenna and Cabernet cardigan patterns. However, over the last couple of years, I've been experimenting with looser style tops that have different amounts of volume than my previous rockabilly-casual style tended to have. I've often found it a struggle to fit those Jennas and Cabernets over the top of a lot of the tops and dresses I usually wear these days. Therefore, it made sense to include a slouchy, 'boy-friend'-esque cardigan in my then-forthcoming #2018makenine project plans. After some poking about, I discovered that I already owned one that I thought might fit the bill. 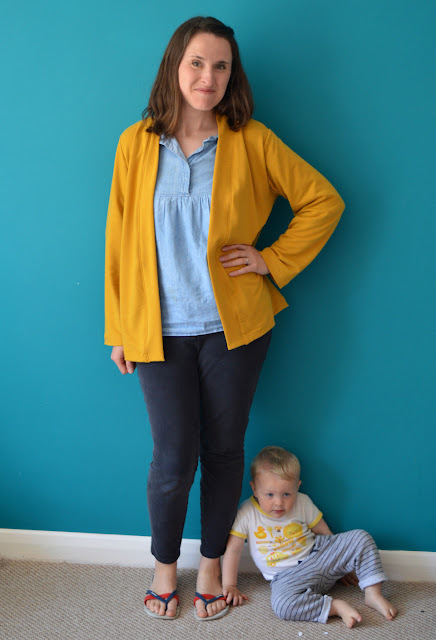 An old copy of Burdastyle magazine that was nestling on my shelves contained a slouchy looking cardigan pattern, it's this one that can also be bought via the Burdastyle website (spoiler alert: I wouldn't bother). I traced out the pieces and combined the lower sleeve piece with that weird extra band that formed the top part of the sleeve to make it into one pattern piece. 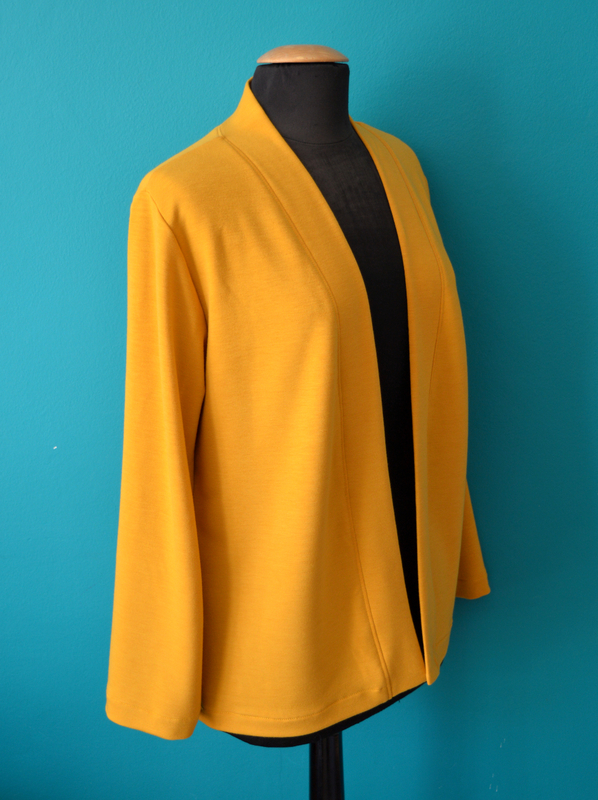 I requested and was kindly granted a sample length of this fabulous mustard french terry from Girl Charlee UK, and got to work. (Ironic) Ta da! So hideous. I want to blame the way the cardigan is obscured in the shot on the Burdastyle model, but equally I could blame my own eyes for not seeing that this cardigan pattern is pretty horrid (IMO), and has also been made up in a much sturdier knit than what I had tried it in. Either way: FAIL. The project got thrown into the corner of my sewing area, promising to return to salvage the fabric when I felt less rubbish about the whole debacle. 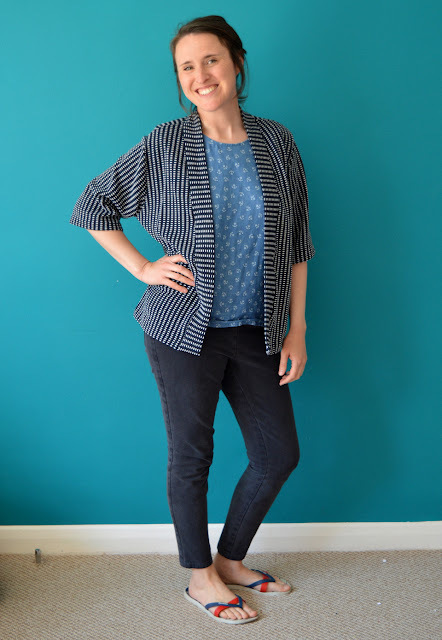 Whilst the fail-cardigan resided in the corner of shame, I was asked to take part in the blog tour for Wendy Ward's 'A Beginner's Guide to Sewing with Knitted Fabrics'. As part of that, I made her Kinder cardigan pattern, and liked the result so much I went on to make another. 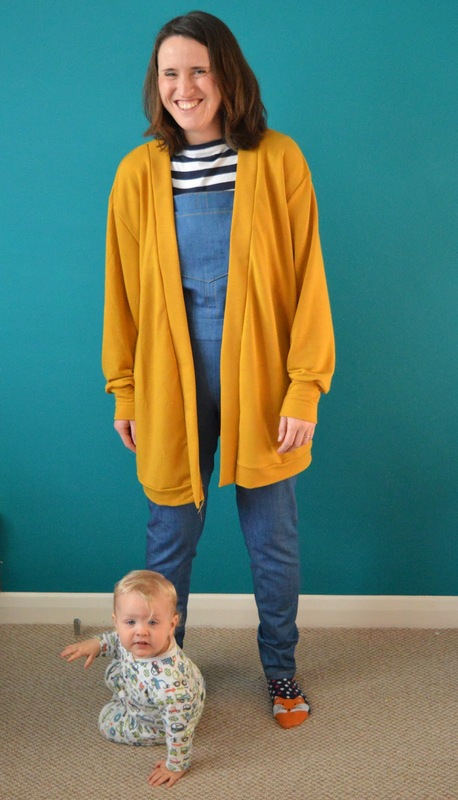 Having worn the living shizzle out of both AND knowing that they were able to worn over looser tops, it didn't take me long to work out what to do with the mustard french terry, once I'd salvaged what I could of it. After slicing up the failed Burdastyle cardigan, I realised I wouldn't have quite enough fabric, so I begged Girl Charlee for an additional metre, which they were swift to supply me with, the legends. However, even with the extra fabric, I didn't have quite enough to make the mid-length option (as per my black ponte version). So my new mustard version ended up precisely half-way between the short and mid length pattern options. I even remembered to alter the neckband pieces as well! Let's talk more about this fabric. In short: it is AMAZING. It's soooo soft and has an amazing drape, perfect for a flow-y cardigan plus I bet it would work fabulously for a knit skater-style dress, if those are your bag. Because of its softness, I decided to opt for the cuff-less sleeve option of the pattern, and the whole this has worked perfectly. I LOVE wearing this cardigan so much. I knew that a mustard coloured cardigan would work well with the rest of my clothing selection because of how much I have worn my mustard Cabernet cardigan (and the mustard hand-me-down RTW cardigan I made the Cabernet to replace). However, I must admit that I have barely worn my mustard Cabernet now that I have this Kinder one. It fits over all my tops and dresses much more easily and feels so lovely to wear that I can't resist reaching for it first. I've learnt the hard way to always reinforce the shoulder seams of knit tops. For this project, I added an extra cute little detail by overlocking some narrow rainbow grosgrain ribbon into the shoulder seams of. It makes me very happy when I see the rainbows as I'm popping it on. With the remains of both the original fail-digan and the extra metre that I was sent, I was able to squeeze out a pair of joggers and a T-shirt for Frankie. The joggers are currently covered in yogurt so I couldn't get a photo, but I used the same Ottobre magazine 'straight stripes' joggers pattern that I used for these pairs because they were such a success. For the T-shirt, I used the free Ringer tee pattern by Brindille & Twig, that I previously wrote about here. This time, I omitted the bottom band and added a little woven ribbon detail, in part to help distinguish the front easily when getting the squirmy little guy dressed. 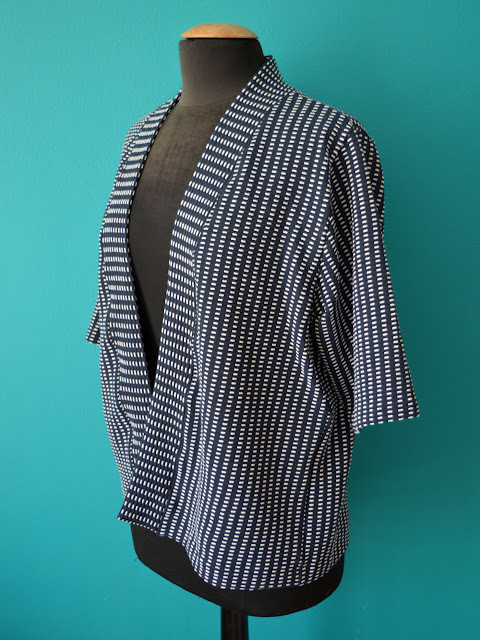 After creating such a successful cardigan, I had an eye out for other fabric that the Kinder pattern could work its magic on. 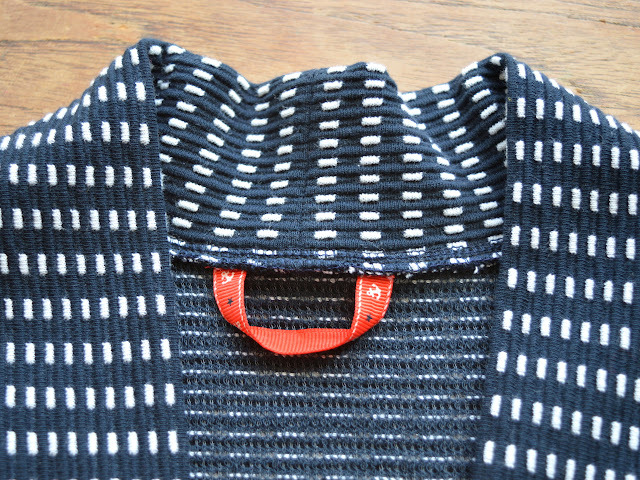 I ended up with an end of roll length of this interesting navy and white knit (sadly no longer in stock) from Fabric Godmother whilst working at one of their open days earlier this year. I really loved it, and it certainly fit within my usual colour palette, however, with less than a metre of it, I just wasn't sure what to do with it. 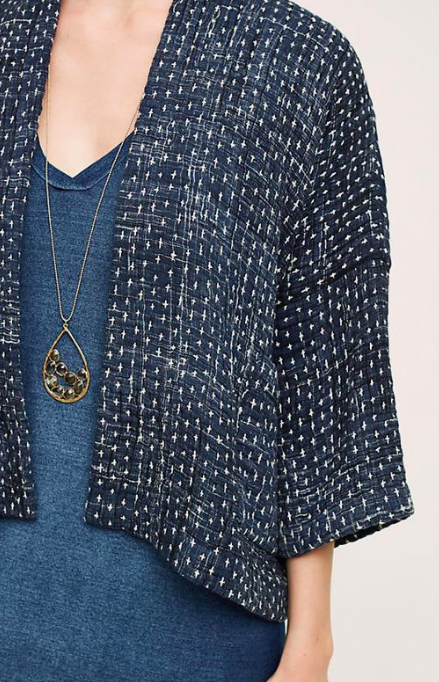 Then I remembered this image (see below) from my Pinterest boards of a cardigan/jacket-hybrid that I believe came from Anthropologie that used a fabric with a similar look. I didn't think a cardigan like this would use much fabric, so with the Kinder pattern in hand, I attempted a vague recreation of the Anthropologie garment. I opted for making my version 5cm longer than the short-length option on the pattern. The sleeves ended up a bit shorter than the 3/4 length I was aiming for because I was was working with very limited fabric. However, I think overall the proportions work ok, and there's definitely a passing resemblance! I didn't use anything cute to reinforcement the shoulders in this version, but I did add a little nautical back neck hanging loop. It's something that I wished I had included in my mustard version to keep it from slipping off the hanger. Despite being completely my colours and style, I decided to make this version for my amazing and inspiring friend Harriet, who lives in Barcelona. In our correspondence, I had offered to make her a garment as she reads my blog from time to time and is always very complimentary about my creations. 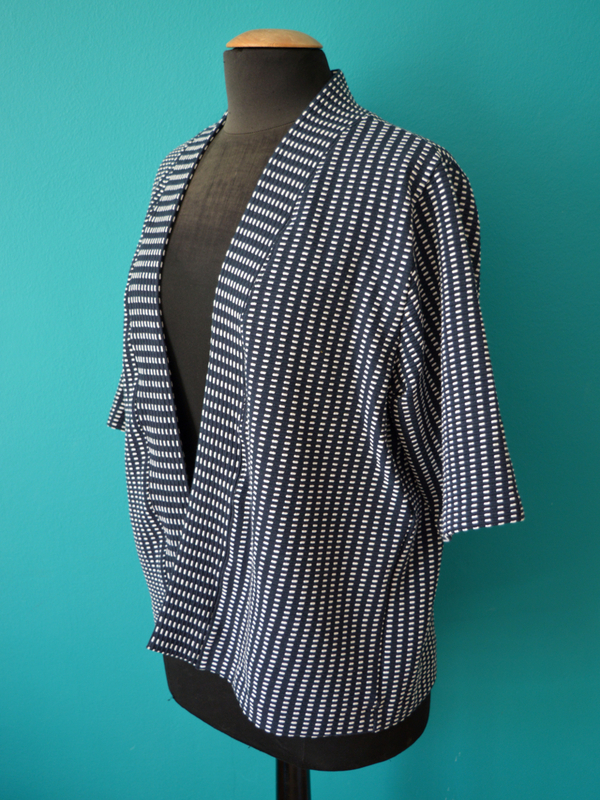 She had mentioned that she liked my cardigan/jacket creations, and although I think she might have been referring to my La Trop Facile jacket, the Kinder has a similar kimono-y, fastening-free look so I hoped that she would appreciate this project. She's received it and says that she loves it, and it truly gives me more happiness to know that she wears it than it would if it lived in my wardrobe, particularly because I already have three Kinders and three navy cardigans already in there. Dolores has been the main beneficiary of my selfless sewing lately, especially for these 'Free Pattern Friday' makes, so when Brindille & Twig recently released their new free Bummies pattern, I knew I could finally redress the balance a bit in Frankie's favour. This pattern release coincided, fortuitously, with a heatwave here in the UK that lasted for a couple of months, and is probably now set to return for a while after two days of (very welcome) rain. Frankie does NOT appear to enjoy heat. Yet, when he's too hot and we take his clothes off, he also thinks his nappy needs to come off too. These bummies so far, somehow, have managed to fool him into not taking his nappy off whilst he's otherwise nudey. Thanks heaps to Brindille & Twig for sharing their hard work for free, AND for aiding us in this useful deception. I would describe this pattern as an updated, modernised version of a traditional nappy/diaper cover, designed for knit fabrics. 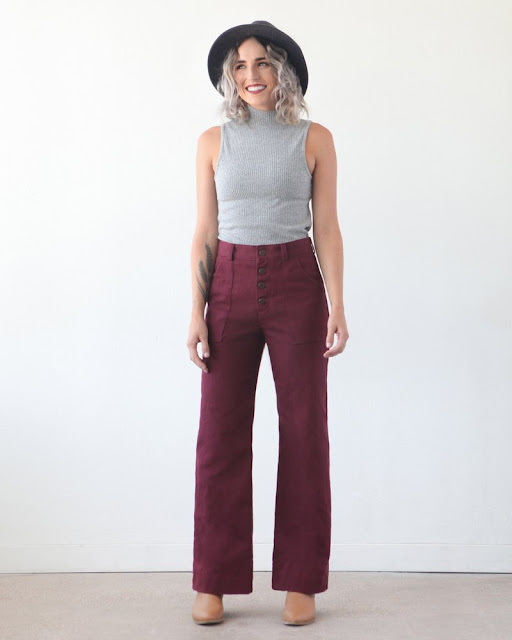 The waist is elasticated with an optional drawstring, and the pattern includes two variations for finishing the leg holes: elasticated or banded. This pattern has been graded between preemie and 2-3T (heights 44cm to 96cm). 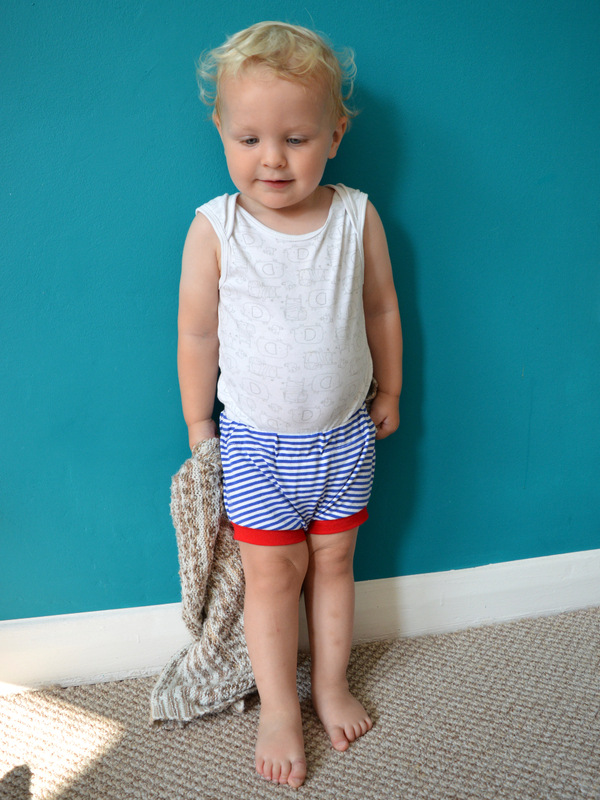 However, I'd really recommend choosing your size, for this and all B&T patterns, based on the child's height rather the age (or I just tend to pick a size down from their actual age) if you want the garment to be worn straight away. For example, although Frankie is a substantial 22 month-old, I picked the 12-18 month (84cm) pieces and the fit is perfect. The fabric suggestion states 'knit fabric - most types will work'. For both my versions, I used a single jersey of cotton with elastane/lycra/spandex, which seems to have worked well as they are a suitably light weight for the hot weather, but also great for moving about. Although I don't think the stretchy content is absolutely necessary for the main part of these garments, I do think it'd be the better choice for the leg hole bands if you're making that version. 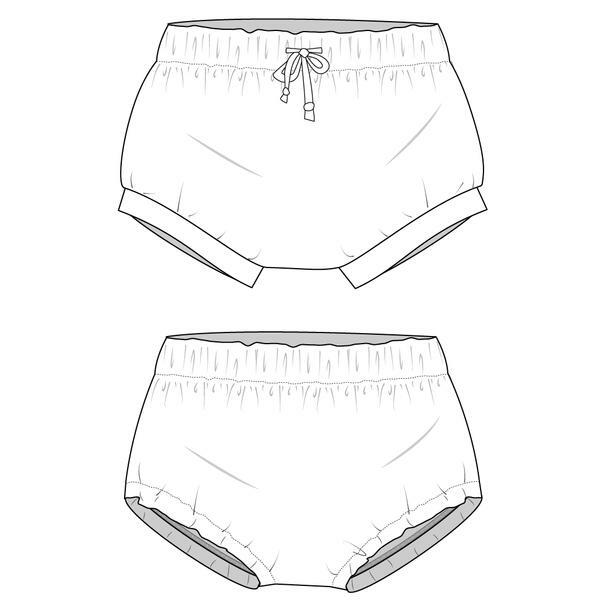 Thin loop-back French terry and interlock would probably also be great options for the main parts/elasticated leg hole version, but you'd want to avoid anything thicker (like a ponte perhaps) that would be too bulky for the waistband. Plus, one of the best bit about making this pattern is that you can bust the hell out of your scraps bin! The 'monsters and snacks' fabric version came from the improbably small leftovers from this project, and the blue and white striped fabric was harvested from this top that had got too worn and ratty in its former incarnation. I'd love to see some made from refashioned/upcycled old logo T-shirts as well. I'd say that this pattern is very typical of the six or so other B&T patterns I've now tried. 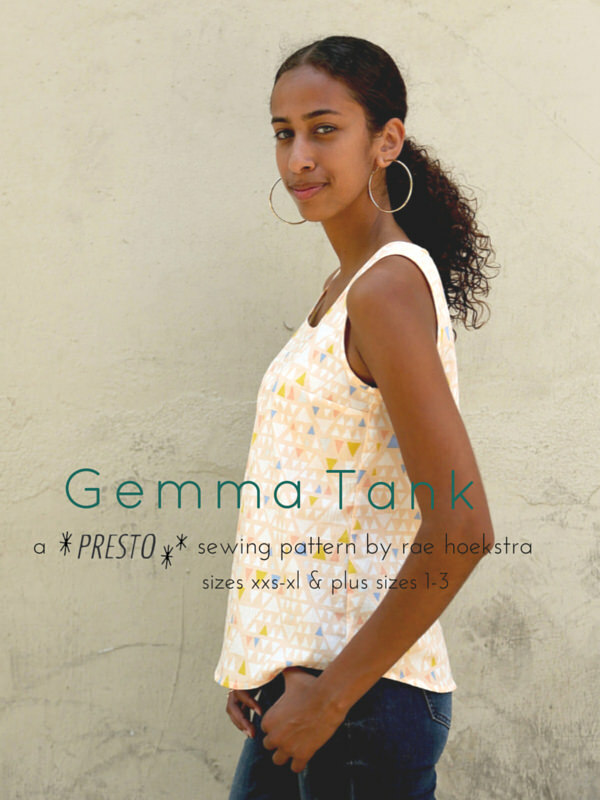 The PDF pattern and instructions are bright, very clear and user friendly. I'd say this pattern would hold no significant issues for a beginner sewer (or beginner to knit-sewing), just be aware that the seam allowance is a scant 6mm. However, you could add a bit to all the edges and make the seam allowance larger before cutting out your pattern pieces, if you so wished. When making the bummies, I had a concern that the measurements included for the length of the waist and leg hole elastic might be too tight for my marginal-chubster (I'm not sure that term is very PC, now I've written it...). So I added an extra 2cm to the waist elastic, but ended up removing it again. 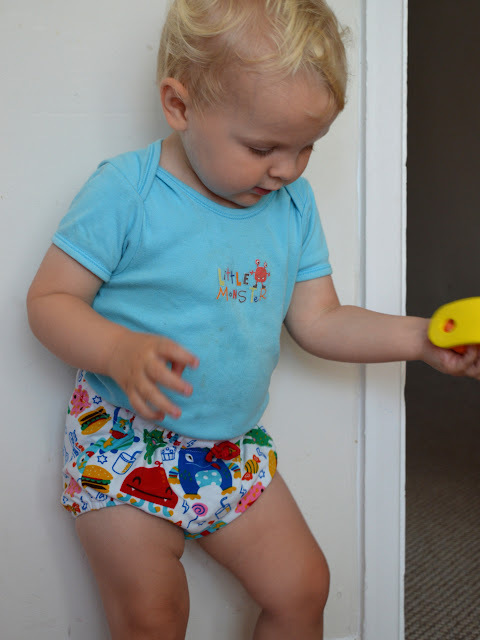 I'd been basing my assumptions on the measurement of elastic I usually cut when making him trousers and shorts, but I'd not figured out that these bummies need to fit more snuggly for them to perform their nappy-enclosing duties. I did find that the length suggested for the optional waist tie/drawstring was a bit short. Also, I didn't like how the instructions recommend to just snip holes into the knit to thread them through rather than making button holes or adding eyelets, or even just adding a little square of interfacing to the back of that area. I know that button holes and eyelets would make this a less speedy and beginner friendly make, and that usually knit fabric doesn't fray, but on my version the holes started to look a bit tatty and stretched out pretty quickly. In the end, Frankie couldn't deal with having a drawstring anyhow and seeing as it was clearly annoying him, I removed it. The fit of these bummies is really cute. They are kind of a bit pouchy, and I wasn't sure Frankie would deal with the volume (he's quite opinionated about his clothes for someone who can't really speak yet), but he's been fine in these. I do think that the leg hole elastic could do with being slighter looser for his thighs. Obviously all kids are different shapes and sizes, but I'd recommend you keep an eye out for that if you make the elasticated leg hole version. I'm not feeling very creative right now, so all I can suggest is playing around with your fabric scraps and old/unwanted knit garment, perhaps using different fabric for the front and back pieces, as well as for the leg hole bands if you choose that version. And of course adding appliques, patches, motifs etc. etc. I'd love to hear any more suggestions... Oh, and I'd DEFINITELY recommend adding a ribbon loop or label of some kind to the back, as at a glance, is can be difficult to distinguish which is the front and back if you haven't included the drawstring. I warn you: making these could be addictive! Two or three pairs of these bummies would make a fun and impressive, but really pretty simple, gift for a baby or toddler. And it could be a useful pattern to have on hand for surprise-hot-weather or last-minute-pre-holiday sewing if additions to a child's wardrobe is required!